Chanakya who lived in the 4th century BC was a leadership guru per excellence. His ideas on how to identify leaders and groom them to govern a country have been well documented in his books Kautiliya’s arthashastra. 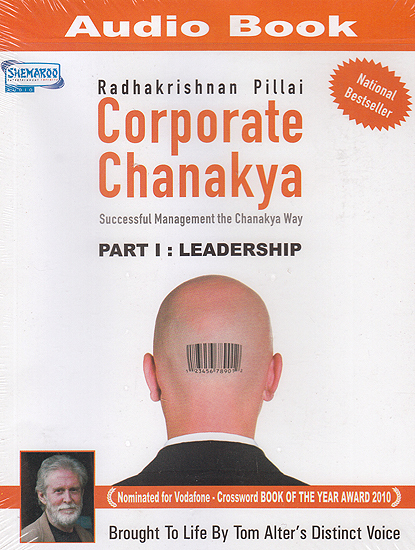 In this Audio Book series the author simplifies the age old formula of success for leaders of the corporate world through Successful Managements Chanakya way. •	What a leader should not do. Radhakrishnana Pillai Studied the ancient text Kautilyas’s Arthashastra at the Chinmaya international foundation Kerala under the guidance of Dr. Gangadharan Nair. Educated in the field of management and consultancy he later proceeded to do his MA in Sanskrit and a PhD in Arthashastra. He also started a company called Atma Darsan in the field of spiritual tourism. Pillai spreads the knowledge of Arthashastra to millions of people across the globe through his lecture workshops and training programs. Director of SPM Foundation and founder director of Chanakay institute of public leadership at the University of Mumbai he designs various leadership programs. He is a recipient of the sardar patel international award 2009.